When it comes to creating web sites we are the professionals. We make all types of web sites, including sites that suit your needs, sites that suit your wants and sites that suit your budget. It might also pay you to remember that a business web site and all work done on it thereafter is 100% tax deductible. CGI - Next up comes the CGI type of web site. CGI stands for common gateway interface. A CGI site is similar to a HTML site but it does have more functionality. Just like the HTML site you can use images and text in any combination you like. The bonus of CGI is that you can log into your web page from anywhere in the world and change information on the fly. You can also dynamically create new pages on the fly. All you need is a computer that connects to the Internet. 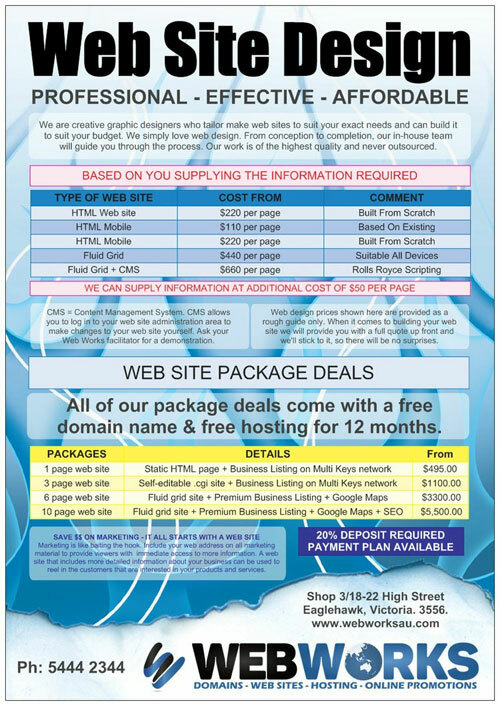 A 3 page CGI web site will cost you around $900 + GST. PHP - Next up comes the PHP web site. PHP stands for Hypertext Preprocessor (a recursive acronym). Now this is pretty serious functionality. It has all the features of HTML & CGI plus PHP works with your server and can take advantage of a database. This means you can store things like a list of your products and have the site display them however and wherever you choose. Most e-commerce sites are built using PHP. A 4 to 5 page PHP site will set you back around $2000 + GST. FLUID GRID - A fluid-grid web site is built using the PHP framework and has the same incredible functionality. The advantage of a fluid-grid web site is that it will dynamically change appearance depending on the type of device being used to view it. A standard web site is normally built to suit a desktop or a laptop computer and may not present well when viewed in other devices such as a tablet or a mobile phone. With fluid-grid it is more expensive because we need to build 3 versions of every page and the coding automatically pulls out the right page for the viewer. Now that mobile phones and tablets are just as popular as the good old computer it pays to have a site that will work for everyone. Some search engines will push you out in ranking if your site is not mobile compatible. A 5 page fluid-grid site will set you back about $3000 + GST. MOBILE SITE UPGRADE - If you are on a tight budget and can't afford to go the whole hog with a fluid-grid web site then we do have a module plugin option that we can add to your existing web site to make it mobile compatible. Admittedly it's not as pretty as the fluid-grid setup but it does pass the search engine smell test and works just as good. The module is ideal for use with HTML, CGI and PHP type web sites without the fluid-grid option. This option works out at roughly $100 per page + GST.